Articulate Storyline 2 is the easiest way to create interactive courses and content. Pre-built interactive elements—such as buttons, markers, and sliders—let you add interactivity in minutes. And slide layers, triggers, states, variables, and motion paths make it easy to build custom interactions. In this series of tutorials, we’ll show you how to use all of these features to create engaging interactive content. If you’d like to practice while you watch, please download these practice files. Any object you put on a slide can have multiple states. Changing the state of an object when a learner does something—like hover over it or click on it—makes the object feel alive. 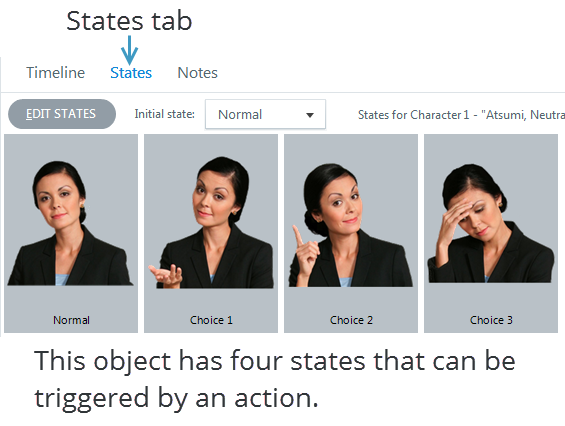 What’s great about Storyline is that you can add multiple states to any object you put on a slide, including characters. You can then add a trigger to the object (detailed below) to change its state when the learner takes a certain action. Slide layers sit on top of the slide and let you create interactivity without building multiple slides. You can add triggers to slide layers to show or hide them when a learner takes a certain action. 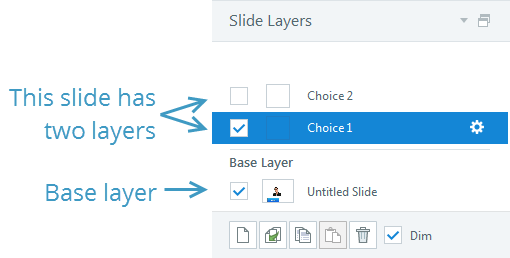 For example, you could show a slide layer when a learner clicks on a button. Assigning triggers to objects is how you make things happen (jump to slide, show layer, change the state of an object). Anything interactive will have one or more triggers. Triggers can be applied to any type of object: buttons, shapes, images, text, and even characters. Because it's Storyline, you'll never have to write a line of code. 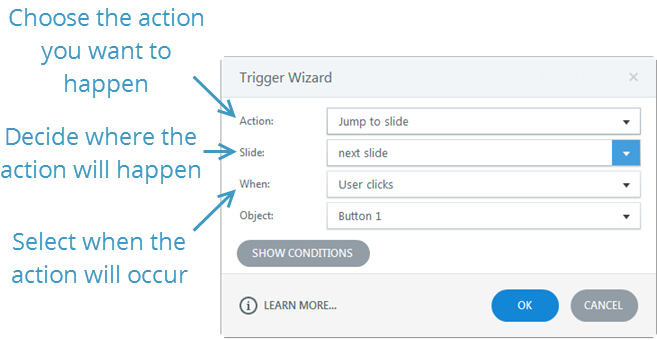 Storyline's Trigger Wizard makes it even easier by guiding you through the process. So, any time you want something to happen, you need to create a trigger. This can include jumping from one slide to another, change the state of an object, showing and hiding layers, and adjusting variables. If you need an action, you need a trigger. Let’s get started by creating a simple interaction using triggered state changes.